Boone and Crockett Club Big Game Awards limited editions, four consecutive awards periods spanning 1992-2003, leather, slips, unread condition - Sportsman's Legacy, Fine firearms, related books and sporting collectibles. Representing estates, collectors and nonprofit conservation organizations. 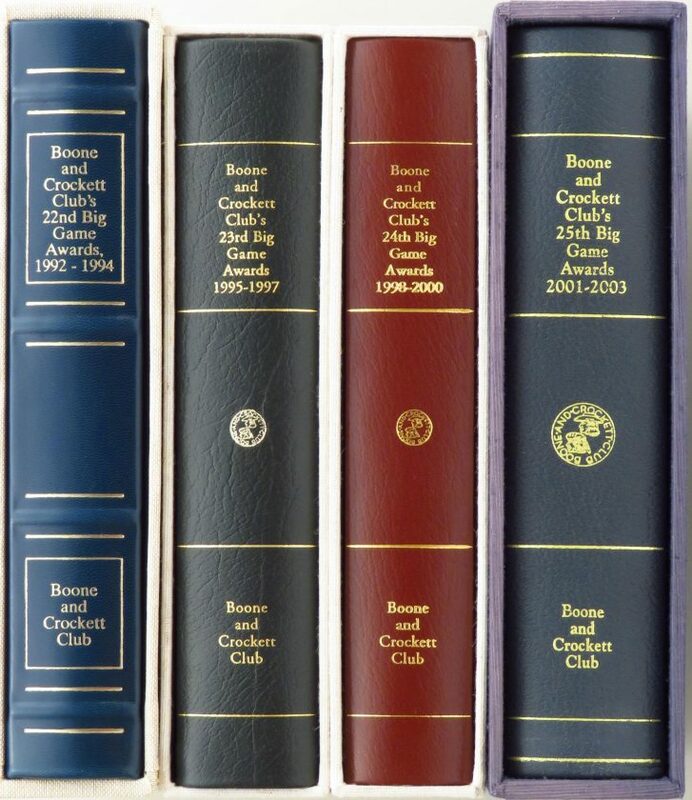 Boone and Crockett Club Big Game Awards limited edition books with leather bindings, linen slips and signature pages. The 1992-1994 (22nd Big Game Awards Period) is number 53 of 100, includes a marker ribbon and has gilt edge pages. The 1995-1997 (23rd Big Game Awards Period) is number 3 of 50. The 1998-2000 (24th Big Game Awards Period) is number 11 of 50. The 2001-2003 (25th Big Game Awards Period) is number 22 of 25 and has a half-leather binding. Each of the four remains in unread condition. The price is firm and layaway is available. $750 plus media mail. Proceeds benefit the Wild Sheep Foundation.